For the Fun Monday challenge, thoughtful Robin of Pensieve is asking us to present our favorite words of inspiration. Although I recently posted this quote, one of my favorites is from the show West Wing. Leo empathically supports Josh who is suffering from post-traumatic stress. out a prayer, throws it down in the hole and moves on. Then a friend walks by. "HeyJoe, it's me, can you help me out?" And the friend jumps in the hole.Our guy says, "Are you stupid? Now we're both down here." The friend says,"Yeah, but I've been down here before, and I know the way out. I realize that professional help is sometimes needed, but many times all we need is a little help from our friends. I try to be this kind of friend. Another quote I try to follow is from Matthew 5:44. Jesus said, "But I say to you, love your enemies and pray for those who persecute you." I find this commandment tremendously difficult to follow. Still, if we all worked towards this goal, the world would be a much better place. A final inspirational quote is new to me today. Our pastor showed a clip to the movie, I Am Legend, to introduce his sermon titled, "Light up the Darkness." The clip included this quote that the Will Smith character, Dr. Neville, attributed to Bob Marley, the famous Reggae singer, "The people, who were trying to make this world worse... are not taking a day off. How can I? Light up the darkness." I like the thought of trying to light up the darkness each and every day. Look for the list other inspirational quoters at Robin's place. Spring has been arriving slowly in my part of the world. Temperatures most of the week continue to be chilly here in northwest Indiana. On Thursday, we had something that I call thunder snow. That is to say that we had lightening and thunder during a snowstorm. Nonetheless, if you look at the outside world very carefully, you can see signs of spring. On Easter Sunday, Daddy D and I looked for specifc signal of the new season. This unique flower is what we found at a local park. Skunk Cabbage , Symplocarpus foetidus, as the species name indicates has a fetid odor. I am the youngest of three sisters. You may have read a little about my sisters in one of my Fun Monday posts earlier in the summer. Recently, my oldest sister, Margaret, who is a world traveler sent my middle sister, Betsy, and me each a festive pin of three women. 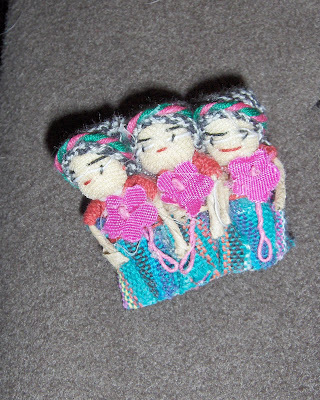 Margaret's plan was for each us to have and to wear one these handmade pins from Guatamala. This note accompanied the lovely pin. 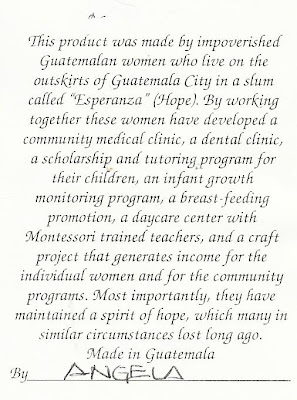 I love the pin because these women are working to improve the lives of the people in Guatamala. Furthermore, I like the pin because it does remind me of my sisters. 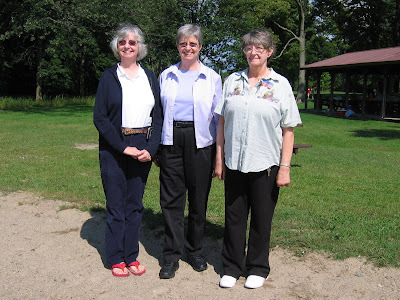 Unlike the women in the pin, who appear to be triplets, my sisters and I look different than each other, but there are familial similarities. 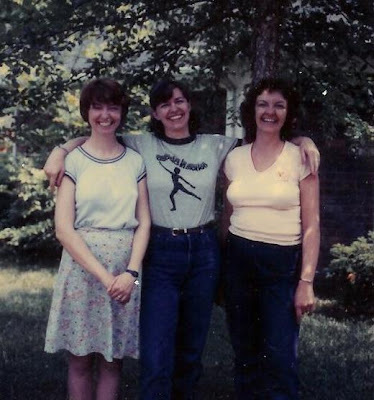 The three of us are tall, and growing up we all had dark brown hair. In the above picture, I must have been about 18 months. 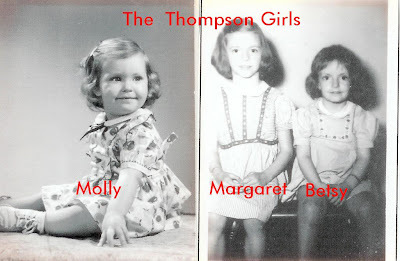 If the picture of my sisters is from the same time period, Margaret would be 9 and Betsy 5. 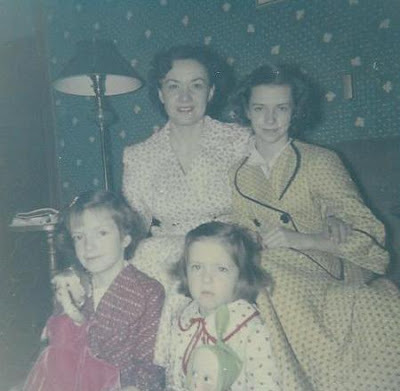 The picture of the Thompson girls including our mother Laura in Christmas robes was taken in December of 1952. Can you believe that anyone would actually choose the dark green wallpaper? 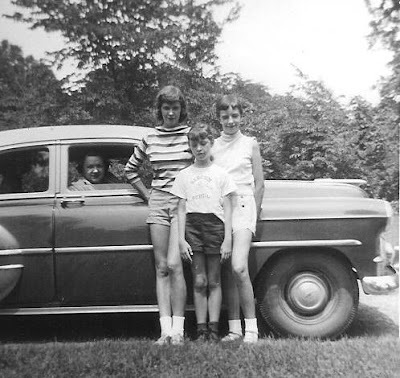 This picture from 1957 shows the three of us in front of our first family car. Our family did not own a car until the year that Margaret turned 16. 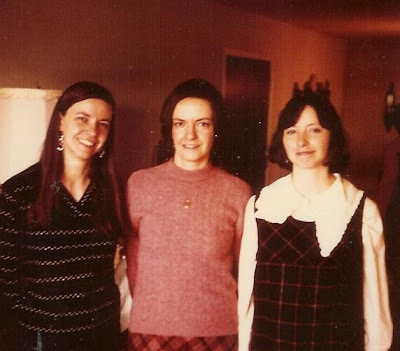 In this picture from 1970 Margaret is on the left. Betsy is in the middle. I am the pregnant lady on the right with the wrinkled collar. In this picture from the early 80's, I am on the left. 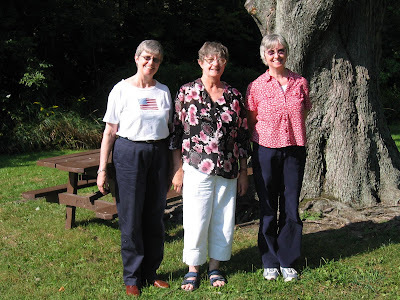 Margaret is the middle, and Betsy is on the right. Notice that I am no longer the littlest sister. In fact, I tease my sisters by telling them that I am the tallest. On the rare occasion when the three of us are together, I encourage us to pose for a picture to prove once again that I am the tallest. The following pictures in 2005 and 2006 are two such pictures. If I am not the tallest at least, I have the whitest hair. 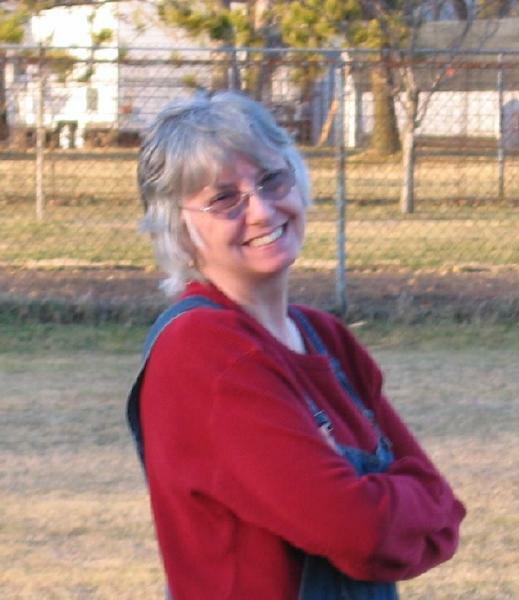 The venerable Swampwitch of Anecdotes, Antidotes, and Anodes is the hostess of this week's Fun Monday. Swampy is essentially asking us to compile an alphabetical list of attributes on a topic of our choice. My list includes reasons or excuses for my absence in the blogging world. Because of some of the reasons listed above, I was unable to participate in last week's Fun Monday hosted by Nikki of My Husband Calls Me Weird. The challenge that she offered the participants was to tell about words created by our family members. 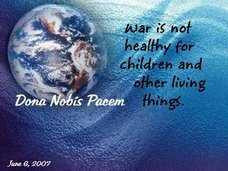 I remember a few endearing words spoken by our sons as babies. Our older son, Dean, called music, monkeys. Later at 18 months, he called hamburger, hangabur. When he first said this word, I did not understand what he meant so he repeated the word slowly (as if we spoke a different language), "hang-ga-burr." Normally, Dean enunciated his words very clearly and seemed to have no trouble speaking correctly. However, we thought that his word was so cute that we did not correct his pronunciation of hamburger until a few years later. Our younger son, Luke, spoke well too. At 18 months, he would say "thirsty" when he needed a drink clearly enunciating that difficult "th" sound. Luke said some unusual phrases, like " When I was a blue child." and "I can't fly." Although lack of Luke's flying ability may be obvious, why he was compelled to relay about being a "blue child" his parents will never know. I wish to thank both Swampy for hosting this week's adventure and Nikki for hosting the fun St. Patrick's Day event. If you wish to participate in this week's alphabetical challenge, visit the Swampwitch at Anecdotes, Antidotes, and Anodes. I trust that both Swampy and Nikki will forgive my two for one Fun Monday post. In my Sunday post on March 16, I said, "Hello," to spring. However, spring in this part of the world did not actually arrive until Thursday, March 20 at 5:48 UT. Furthermore, in our corner of the Earth, we have four seasons with vast differences in temperature and weather patterns. Spring here in Indiana is marked by rain, warming temperatures, and blossoming flowers and trees. One phenomenon that I witness every spring and every fall as I drive to work at about 7:00 AM is the sun rising directly in the east right down the road in front of me. Although the sun shining in one's eyes is inconvenient, I find this astronomical occurrence fascinating. Our route to work is mostly down 73rd Avenue, a east-west bearing street that has been a pathway for mankind for centuries. In prehistoric times, the street was the Great Sauk Trail used by native Americans. In 1912, the street became part of the first road across America called the Lincoln Highway or US 30. This ancient path runs in a straight east-west direction, perhaps due to historic travelers following the sunrise to the east or the sunset to the west. Yesterday, on the first day of spring as I was squinting at the gorgeous sunrise, I planned to photograph the sun rising at the east end of 73rd Avenue this morning and then to blog about this grand event of the sun rising due east on the Vernal Equinox. However, this is what our spring world looked like on the second day of spring in 2008. I guess that the spring rains and flowers will come later. Although the creative blogging event hosted by Elizabeth Joy at Wildflower Morning is over, I have one belated contribution. I have been sickly for the past month and unable to participate in some of the weekly events of Wildflowers in Winter. 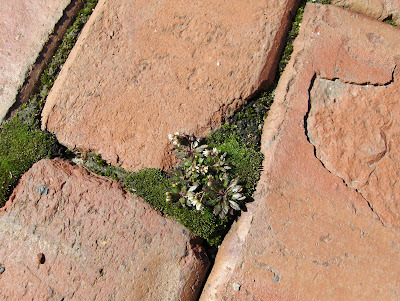 For the last week of the inspiring series, Elizabeth Joy asked us to post a picture of an early wildflower in our area. This picture taken last year at a local park is usually the first flower that I see each spring. If are not observant, you might miss this tiny harbinger of spring, Whitlow's Grass. As a continuation or an addendum to yesterday's Fun Monday memorable movie quotes, I would like to add my favorite West Wing quote that Leo McGarry said to Josh Lyman after Josh's three weeks of therapy with a trauma psychiatrist. a prayer, throws it down in the hole and moves on. Then a friend walks by. "Hey Joe, it's me, can you help me out?" And the friend jumps in the hole. "Yeah, but I've been down here before, and I know the way out. I love this quote. Sometimes a friend can offer help when professionals struggle to offer the right kind of help. Another quote used by a few of the Fun Monday participants that I would like to highlight is this quote from Little Shop of Horrors, "Feed me, Seymour." said by the man-eating plant Audrey II to Seymour Krelboin. Daddy D and I grow some exotic plants that produce a large unusual flower that produces a fetid odor. You can read about these plants in this entry on our team blog, Mama Said, Papa Said. This winter one of the plants has produced another stinky but fascinating bloom. 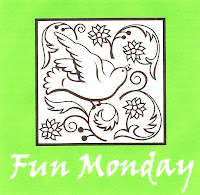 This week's Fun Monday host is I.T. Guy from Life, IT, and Governance. I.T. Guy is asking for five favorite or memorable movie quotes. He has also requested that we identify the speaker and to whom we might say these specific quotes. 1. "You are holding my heart." said by Claire Cooper played by Jamie Lee Curtis in Forever Young. I would say this to my sweet lifemate and lover, Daddy D.
2. Who can forget the memorable, " I'd rather have 30 minutes of wonderful than a lifetime of nothing special", stated by Shelby played by Julia Roberts in Steel Magnolias? These wise words could be said to anyone who is down and needs encouragement. 3. These words said by the dynamic teacher, John Keating, played by Robin Williams in the Dead Poet's Society is sage advice for all youth. too late to make from their lives even one iota of what they were capable? seize the day boys, make your lives extraordinary. 4. These words from the opening of Love Actually are wonderful thoughts for all of humanity. These words make my heart sing. that love is everywhere. Often it's not particularly dignified or newsworthy, but it's always there-fathers and sons, mothers and daughters, husbands and wives, boyfriends, girlfriends, old friends. When the planes hit the Twin Towers, as far as I know none of the phone calls from the people on board were messages of hate or revenge-they were all messages of love. If you look for it, I've got a sneaky feeling you'll find that love actually is all around. 5. My final choice from The Empire Strikes Back is the dramatic declaration, "No, I am your father. "Darth Vader says to his son, Luke Skywalker. These are words that my husband occasionally says to our son, Luke in jest. - although Daddy D may state the phrase more like "LUKE, I am your father." What are some of your favorite movie quotes? To read other memorable quotes, check out the other Fun Monday participants at Life, IT, and Governance. On to other matters, awhile ago the lovely Pamela of Dust Can Wait recognized me as a rocking grandma. Being a grandma may be my fondest role. I am fortunate to have two lovely granddaughters. Our oldest is three years old. She is a ballerina (and soccer player). Our youngest is about three months old. In this picture, she is telling secrets to her grandpa.